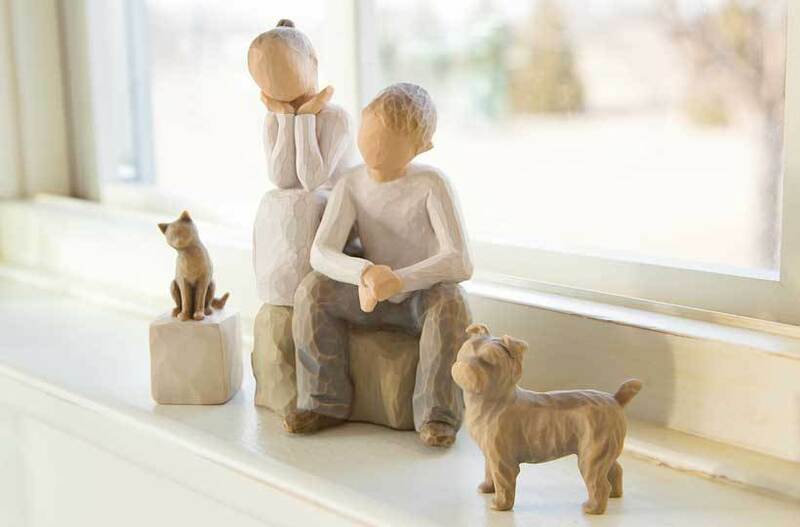 Everyday Blessings and Wishing are sized differently from other Willow Tree figures; more petite than traditional family figures and taller than the small figures. 6.5” high and embellished with gold leaf. Packaging reflects Signature Collection distinction. New work from Susan Lordi. This page reflects pieces introduced over the last 12 months... three new pets joined the family last summer, and have been added to many photos of family grouping ideas for you to click through and imagine. A new floral, Surprise, was also introduced last summer... adding purple tulips to our garden of flower figures. January 2019 sees the introduction of our annual Dated Ornament (a series since 2006) as well as two iconic Signature Collection figures, embellished with gold leaf and carvings.